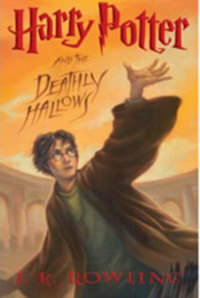 The new Harry Potter cover has been revealed. An URGENT PLEA to Harper Collins: I love your list of upcoming releases from Harper Teen--big faves of the burgerfolk, like Maureen Johnson and Meg Cabot, are on there--but please, please, you MUST restrain the MAD CROPPER who's treating your cover models so brutally! The Cropper (perhaps kin to the Lopper from that old Seinfeld episode) must be stopped! Revoke his Photoshop license NOW, before he crops again! Faces are FAB. Eyes are EXCELLENT. So lissenup, publishing people. Decapitation is so 2006. Heads are the new black. Let's make '07 the year we stop the crop. Hi all...It's Covergirl, punching the clock once again. My job: judging books by their covers. You may envy me--but believe me, it's not all champagne and bags of swag. OK, this isn't exactly a book. To be completely honest, it's a TV commercial for an electronics product. Still, watch it now. It's oh-so-cool and color-licious!! Eye-popping cover--and I happened to open this one to see that the author uses type in interesting ways and employs the interjection "Up bugaloo!" Love it, Mark. Fabulous graphic punch on ths one, no? It's about a Chinese dissident artist living in Hollywood, so the red-star-over-palm-tree image is actually relevant, too, which is always nice. Well-played, Nell! When I see "buyble," I think "Yiddish endearment," not "reference book." Still, the cover is entirely enchanting! The design takes a page from Tord Boontje, a designer with a great aesthetic and a very fun-to-say name. Now didn't that banish your blahs and defeat your funk? It did mine, honeys. See you next time. It's Tess Gerritsen's The Mephisto Club--but at first glance, I thought it was a how-to manual for gastroenterologists. What else could I think, when the jacket art looks like an action shot from a colonoscopy--you know, where they stick a tiny camera lens where the sun don't shine? And there looks to be an obstruction hanging out in the large intestines --or perhaps it's a shadowy figure waiting for his next meal to drop down the old esophagus...I don't have a clue what this story is about, but I can tell you, judging from the cover, that reading it would give me a tummyache. I'm steering clear. It's The Perks of Being a Wallflower, by Stephen Chbosky. Never having been a wallflower, I can't imagine what those perks might be--but apparently they have something to do with chartreuse--a bold color choice for the shrinking violet set. This cover is edgy, and has a photo of some guy's legs intriguingly tucked up into one corner. I might read the book just to discover where the rest of this person is...or I might not read it, but I'd still buy it because it would look great in my living room, where chartreuse is one of my accent tones. Excellent color sense, Mr. Chbosky! and so i must dash. bless you all! It's called Angels Fall by Nora Roberts. Sorry, i mean NORA ROBERTS. I can only guess that nora's loyal readers have a tendency to forget their glasses when they go to the bookstore, and that nora knows this, and that this is why she thoughtfully made her name SO VERY LARGE on this cover. 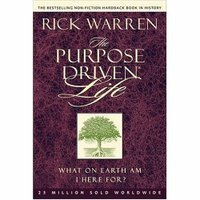 Now here's a book I love. It's River Secrets by Shannon Hale. I haven't read it, but maybe I will someday, because it has an antique-ish sort of painting on its cover, complete with a patina of age and a faux-crackle finish. It's very old school, a tad melancholy, and if it were peeking out of your metallic leather tote, it would make you look quite brainy. It's an ideal accessory for the Euro-fabulous trench I'm ordering in my other browser window right now! Must run and fetch credit-card, burgerpeople. Stay beautiful! Hi, I'm Covergirl, bookburger's infamous (and totally beloved) book-cover reviewer. I'm summering in east hampton. Where are you? Someplace not nearly as chic? I'm so sorry! Anyhow, the folks at the burger prevailed on me to interrupt my intensive pilates regimen to do some book reviewing. So here you go...and remember, I judge books by their covers only--because a book can be a lovely objet, but let's face it, reading can cause crow's feet if you do it too much. 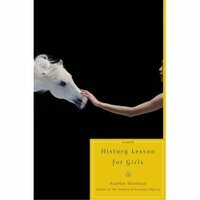 It's History Lesson for Girls, by Aurelia Sheehan. What's not to love? It's elegant, it's got a horse, and the girl's arm is very sculpted. I aspire to an arm like that...just one would be fine! Seriously, there's a divine COMPOSITION thing happening here...it's a fabulously understated look for a book. Props to you, Aurelia! Eeew. Mottled purple? It's looks like something you'd want to show to your dermatologist STAT. The tree's ok, but that banner up top..."The Bestselling Non-Fiction Hardback Book In History"? They really expect us to believe that? And then there's that subtitle: "What On Earth Am I Here For?" Gee, I don't know...what ARE you here for, Rick? I guess we're supposed to read this book and find out. Which is something I'm not gonna do...mos def not, with an icky cover like this. Hi, fellow fans of truth, beauty, and fabulous jackets! It's me, Covergirl, Bookburger's resident book-cover critic, and I want to know: are you wearing sunscreen? what's your spf? have you bronzed lately? I only ask because, well, it's summer, and these things matter. Looks matter. Books' looks matter, too...at least, if you're like me, and you prefer to judge a book by its cover, instead of slogging your way through all those vocabulary words. This cover has a faux-naive quality I adore. It's really very hip-looking. It's just screaming, "Buy this book, read the flap copy, then display it casually on your table at the local java house while you're on your laptop shopping for cute accessories." Know what I mean? And I mean that in a good way! I'm completely in love with this cover. And, from the flap copy, it sounds kinda good too...so while at the java shop or the beach, I may actually crack this one open.Your book's look is working for you, Bryan. It's Godless: The Church of Liberalism by Ann Coulter. Ann, luv, you look silly. All you're missing is a thought balloon above your head that says, Look, I have bazooms! I will now hypnotize you with them and compel you to buy my book! Come, Annie, we're not thinking about the "The Church of Liberalism" when we look at Godless. No, it's more like the "Church of the Cheesehound in a Black Spandex Top on Her Way to Jazzercize Class at a Gym for Desperate Singles." Sorry, dollface...nice spray-tan, though! yes, it's me again...back for another fabulously shallow post in which i judge new books by their covers. So cheer up, Phil! You're still a player! You're still selling books and winning awards! Enjoy life for once, and would it kill you to put some daisies or a nice slice of pie or a cute little dog on your next book's jacket? Total adorability! Kudos to you, Brad Barkley and Heather Hepler, authors of Scrambled Eggs at Midnight...and the nameless person who made your book's look! It's white, it's bright, and it's very all right with Covergirl. It looks so tasty...I might even read this one! No, we're not talking about a glossy-mag model...nor a brand of not-so-hot drugstore cosmetics. We're talking about Bookburger's very own Covergirl, who unashamedly believes that every book SHOULD be judged by its cover. Each week, she'll be sharing her oh-so-shallow picks. Total cuteness...Covergirl is a sucker for thought bubbles. And she loves the groovy graphic trees. It's Nothing But the Truth (and a few white lies) by Justina Chen Hedley. Nice jacket, JC--no lyin'! This book is called Cirque Du Freak #11: Lord of the Shadows : Book 11 in the Saga of Darren Shan. Eeeww...It should be called Cirque du Yuck #11: Lord of the Heinous Color Schemes and Cheesy Blurry Images. Sorry, Darren dear. Better luck with #12!